Lighting Replacement Lampshade for Antique, Vintage or Contemporary Chandelier, Ceiling Fan or Pendant Light Fixture. 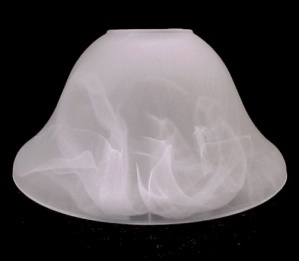 Blown Pressed Clear and White Swirl glass, Frosted Finish, Bell or Bowl Shape, Neckless Fitter hole. Flare Rim: 7 1/4 inches W.
Fitter Opening: 1 5/8 inches W.
Gently Used. Minor signs of use. No cracks. Has minor roughness on inside edge of hole which will not show.